Babcock International Group PLC is amongst the top 200 quoted companies in the UK, supplying support services to government departments and organisations whose activities are heavily regulated by government, such as the Ministry of Defence. Babcock Marine is a subsidiary based in Rosyth, Fife, which specialises in support and engineering services for the Royal Navy. Babcock Marine required an upgrade of its facility on the Rosyth Business Park, and awarded the six-week contract to Colorado Construction. 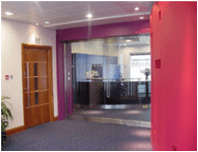 The project involved the complete refurbishment of the ground floor of Navy House to upgrade the area for office use. The works included the installation of new heating, ventilation and air-conditioning, together with upgrading the power and lighting requirements and the installation of new wall, ceiling and floor finishes throughout. A reception area, toilet facilities and extensive telecoms and data were included in the project.